When retired fire chief Carey York is accused by TV reporter Tommy Towne of burning his own warehouse, he contacts Perry, who tells Towne to broadcast a retraction or face a whopping $1.5 million slander suit. Towne eventually goes on the air to admit his first charge was incorrect, sort of�.Carey didn�t torch the building to get the insurance, he says; he did it to keep his son from bankruptcy. A sophisticated machine destroyed in the fire would have helped his son�s competition. Carey never gets a chance to file a second suit against Towne-�the reporter is found dead inside a car at the bottom of a cliff. The car belonged to Carey and that lands the ex-chief in jail for murder. Location: Look for the real L.A.F.D Fire Station 99 in this episode. See here. Submitted by Steve Fox, 1/12/2005. Additional info from Barbara Brafman, 1/13/2005. Location: Vincent Thomas Bridge. A pan shot of this bridge is used to open the scene by the fireboat dock. See here. Submitted by Mitch English, 3/3/2005, and D.A. Supernaw, 3/4/2005. Carey York pays a night time visit to Fire Station 99. Three weeks later, Perry also pays a night time visit to Fire Station 99. In both instances, 3 weeks apart, the exact same automobiles (5 at least), are parked in the exact same places. Submitted by PaulDrake 33, 13 Dec 2014. Russell Thorson makes his final of four appearance on Perry, and his first since 1959. 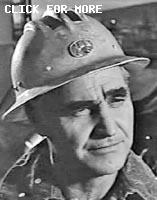 Russell Thorson is best known as a prolific old time radio actor, most notably as Jack Packard on I Love a Mystery. Submitted by PaulDrake 33, 5/13/2009. Holly McIntire, in a role reminiscent of those played by her mother, is the daughter of Jeanette Nolan, a 6-time Perry Mason player. Submitted by daveb, 1/5/2011. Sightings: Quiet Old Man #1 is briefly visible in the courtroom gallery, along with Distinguished Gentleman #1. More here. Submitted by daveb, 1/5/2011. Updated by gracenote, 2/14/2011. (1) A 1945 Pirsch Triple 1250/200 is first out of the station, Center bay, at 04:43. "Triple 1250/200" = 1250gpm pump, 200gal tank, with hose. Quad = Triple + ground ladders. Quint = Quad + aerial ladder. (2) A 1960-1963 Seagrave 100' Aerial Ladder Truck is 2nd out of Station 27 at 04:45 (6th photo down). Common nomenclature is "Tractor Drawn Aerial" (TDA). Best photos are by The Road Ranger (scroll down to last 3 photos, from blog for Tues Mar 12, 2013). See in action here. A different truck was filmed arriving at warehouse fire, see "29" on truck side at 05:14 indicating "Truck 29", Shop No 60037. (3) A 1961- 1963 Crown Triple 1500/400 follows. Here's an almost identical LA County 1965 Crown Triple. "Engine 23", Shop Number 60146, is seen at fire at 07:07. 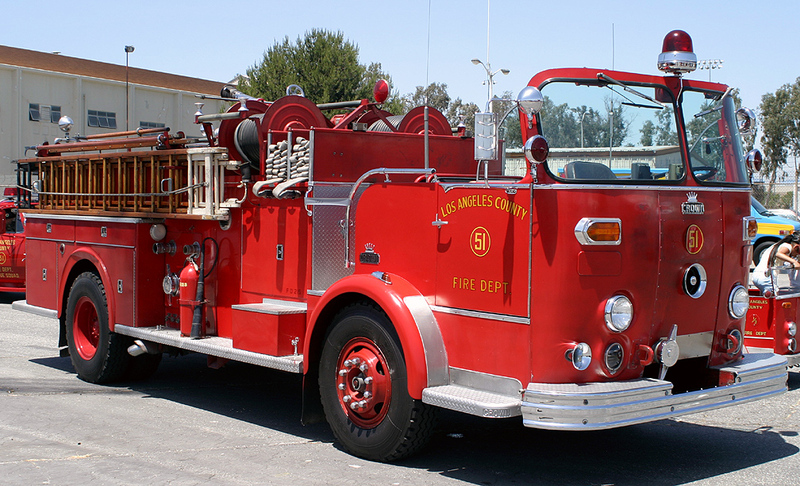 See wiki Crown Firecoach, badge, 1961 advert, at LAFD Station 99. Crown Triples in action (beware fake hydrants). (4) Possible 1962 GMC Yankee Tank Wagon 150/400 (in image, Right side and 2nd from Left) follows (3),(1) & (2) around the corner at 05:01. It's a GMC 5000 medium truck with a 150 gpm pump & 400 gal tank fitted by Yankee Body Company. 400 USgal water = 54 cu.ft (1.5 cu.m) & weighs 3,400 lb. (5) Platoon Commander Moorefield's 1962 Plymouth Savoy 4-Door Sedan, letters "PC" on roof; siren, rotating cherry, & flasher exactly as in linked image. Seen at 05:41, 12:48, 21:35, 25:29 & 28:30. Another is inside Station 99 behind the Crown Triple at 25:21. (6) 1955 Yankee/Oshkosh 4x4 Tank Wagon, Shop Number 749 "Tank Wagon 99", at front of Station 99 at 12:38 (behind flagpole). See "T97" here. (7) Probable 1953 G.M.C. 5-window Light Truck w/Equipment Locker in lieu of P/U box like this later TV "Squad 51" Paramedic truck. Parked beside the Fireboat Station at 21:35. See Shop #s 730 -739 for year & make. (8) 1957 GMC S100 Ambulance, antenna mount on driver's side between rear windows, paint as in image except white roof. At Cliffside recovery site 28:31. (9) two 1962 Dodge D-300 Fire Patrol trucks are across the highway from Vehicle(8) as Moorefield arrives in Car(5) at 28:31. Front grill & headlights: 1, 2. See Shop Numbers 60166 -60168. (1), (6), (7), (8) appear only once each. Appearances of the other Make/Types are not necessarily of exactly the exact-same truck (shop#) each time. I find it a bit grim that the water-tanker bush-fire trucks, which were unfamiliar to me 55 years ago, seem to appear every day on 21st Century TV newscasts. Added by Gary Woloski, 3/9/15. + Unfortunately, the LAFD Historical Archive (lafire.com) appears to be kaput as of this date. An internet search returned many lafire.com urls but all are returning "Error 404, Not Found". :-( Hopefully, it's just temporary. Kilo, 9/12/2018. Character Names: We finally learn from the bailiff that the name of the judge played by John Gallaudet is Richard Penna. Why this name is omitted from the credits is unknown. Submitted by gracenote, 2/14/2011. + In two other episodes, he was Judge Penner. Click on the Actors List in the sidebar, and then click on the letter G. Submitted by gracenote, 8/11/2011. + The bailiff introduces him as Benjamin Penner, at 34:46 of the 2012 Paramount DVD. lowercase masonite, 3/29/16. Perry quotes from Shakespeare, specifically Hamlet: �The play�s the thing wherein I�ll catch the conscience of the king.� (The �king� refers to Hamlet�s uncle Claudius, who murdered the Danish prince�s father and married his mother, the widow.) Submitted by gracenote, 2/14/2011. No Della or Tragg again (despite credit). Miss Street is staying with her aunt, it is explained, but Tragg�s absence merits no mention. Submitted by gracenote, 2/14/2011. + On the other hand, Gertie has a rare, nice extended scene with Paul and Perry, including a close-up. Although a receptionist, she is asked to do a secretarial task. Submitted by cgraul, 10/18/2011. +++ Della's absence and Gertie's extended conversation with Perry and Paul in Perry's office contributed to Towne's ability to barge into Perry's office unannounced. jfh 15Jan2018. Uncredited Actors: Two show up at the elder York�s arrest: Don Anderson as a fireman and Lee Miller as Sgt. Brice. In the courtroom, Anderson reappears as a courtroom spectator (though he still could be the fireman in civilian clothes), and Robert Wegner stands guard at the door. Submitted by gracenote, 8/11/2011. 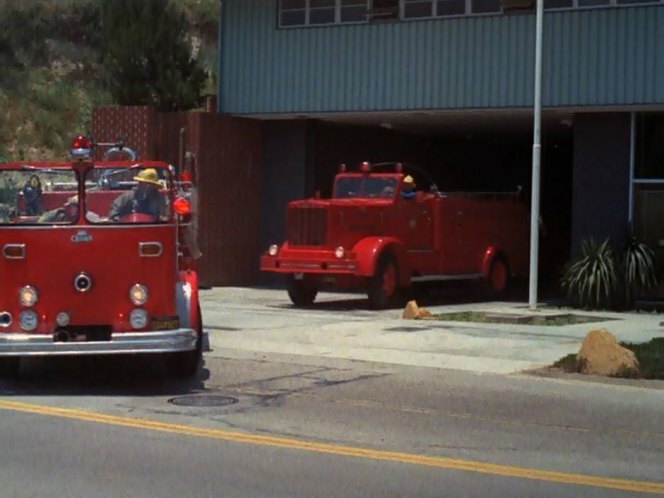 Deja Vu: At least three props were recycled from the previous episode, "Frightened Fisherman": The metal, mesh-screened LANG-JAMES LABORATORIES sign now says FIRE STATION 99; the radio-phonograph with the raised lid from the beach shack in "Fisherman" is now in Carey York's living room; the plank door in Carey's living room with the unusual viewport was also in the "Fisherman" beach shack. Submitted by David H, 10/26/2012. It�s unusual that in this episode they begin the courtroom scene with an American Flag ritual, the entrance of the judge, and other formal procedures not previously aired. Submitted by gracenote, 2/14/2011. The opening scene of the assault and arson is a wonderful example of television film noir: the close focus on the crowbar, use of high contrasting light and shadows, camera rack-focusing to follow the slow-moving hand, and the choreography of the fall after the manager is hit. Very nice. Submitted by cgraul, 10/18/2011. This is one of those episodes where the victim and defendant are both so obnoxious you almost wish the latter was guilty; no Tragg...no Della...a real bummer. Submitted by Notcom, 040516.